CLICK BELOW TO NAVIGATE TO THE PROPER PULLEY STOCK PAGE. ADD QUANTITIES TO THE CART. Header: This is the Micro V Pulley landing page, Google will land here 1st in most cases. 200-300 word paragraph that contains the above HEADER keywords 7 to 10% of the paragraph. 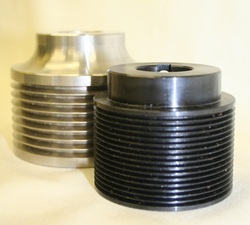 HM Manufacturing is the premier manufacturer of custom timing belt pulleys. We offer made to order sprockets and related components in a large variety of materials and finishes. Custom Timing PulleysThe improvements in timing belt technology allow close manufacturing tolerances of the profiles which helps create the smooth entry into and out of the mating pulley. 1200 Henri Drive, Wauconda IL 60084. Phone: (847) 487-8700 Fax: (847) 487-8707.
uper HC®, Polyflex®, Micro-V®, Hi-Power® and Tri-Power® are registered trademarks of The Gates Corporation.